Thanks to this post from A-Wing And A-Way, I recently learned that April 8 is Draw a Bird Day. 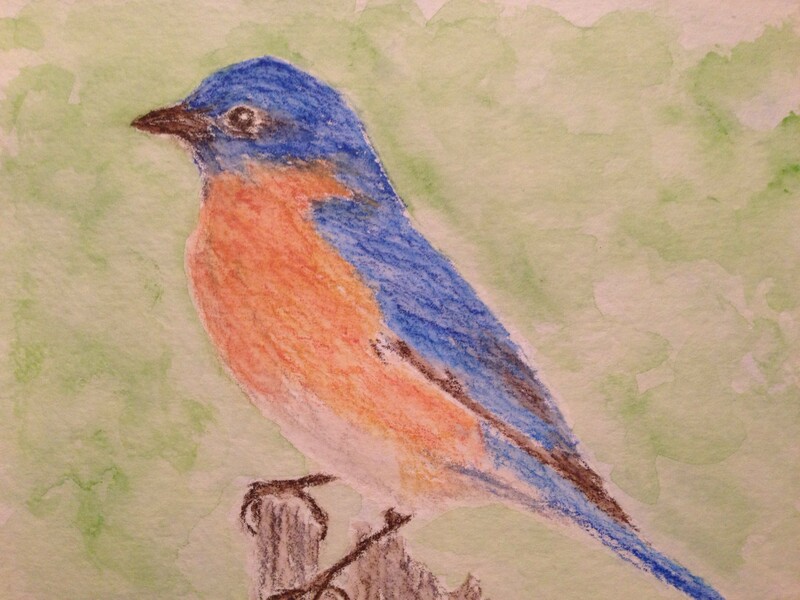 I needed to make a card for my mom’s birthday, and she’d requested a bluebird. So Monday night, while watching a rerun of the O’s Opening Day win (woot! ), I got out my Derwent watercolor pencils and went to town. I had such a good time doing this, and was happy (for the most part) with how it turned out. It also felt good to dash back into realism for a change. Hehe, a little dose of reality never hurt anyone. Right? I miss drawing from nature. Looking forward to maybe having a chance to do some more of that after busy season winds down. April showers are busy bringing May flowers out my way, and I hope Lady Spring is waving her magic wand where you are, too. Yes, the Nats are even more error-prone than the Mets. And the O’s have 2 wins already. Best to your Mets!! I’m so proud of the O’s so far….so many teams are riddled with injuries, as are the Rays’ pitching staff, which has helped us out thus far. Oh Laura – your Mom will LOVE this. I so admire your talent, and I’m sure she is very proud! 🙂 Does she read your blog? Thank you!! She is 91 and hates computers lol! But she’s amazed that I can draw or paint anything. My whole family is, because I tried and tried and never could, growing up!! You gonna try another drawing or watercolor? Wow – you must be the “baby” of the family! Your mom is close to 20 years older than mine, and I am 6 years older than you. How fortunate that you still have her. I hope she is well. She is going to love the bird. Yes!! I’ve been dying to see more of your paintings!! I want to add too – if I let those feelings stop me, my blog would be private, lol. I think the point here is encouragement and support and FUN, not perfection. I’ve done all of that second-guessing, but part of making something every day is really forcing me to not worry about what anyone thinks and just post it. Your first flower was really good, I thought. You definitely have talent. It just takes lots of practice to be happy with watercolor paintings (in my experience) and I’m still not there yet. I’ve come to the point that it’s about fun. FUN. And Relaxation. And DE-stressing. Forget everything else. If you painted it and you enjoyed it, that’s all that counts. Your followers love you and they want to share in your experiences and experimentation. At least, that’s how I see it. Otherwise, I’d post nothing, ever, lol. Thank you so much. When I post my next May I share your encouragement? Of course! I caught it from Lindsay and my artist sister, and we should fling it all around, to the heavens! Wouldn’t it be so freaking cool if everyone picked up a paintbrush or a colored pencil and went crazy? We could unwind this whole world and all the crazy knots! 🙀😱🙀 Go wild, ‘nista! Very cool — the bluebird of happiness! Happy Draw A Bird Day!!! Thank you! And the same to you! Thanks for spreading the word! Thanks for the great suggestion and how fun it was to create a bird painting. Your bird is lovely. Love, love, love your bluebird! Happy Spring! Thanks, Jean! Same to you and yours! Lovely – what a great idea to have a draw a bird day! Thanks! It wasn’t my idea, but I definitely approve. 🙂 It was fun! Ack, if I had known…! I already did non-bird-related haikus for my daily exercise. Anyway, I love this drawing. It’s beautiful, and the eye-beak-head details are especially well done. I like that idea. 🙂 More birds! All the birds! We could even do a squirrel day! Lol! Seriously, there are so many different kinds of birds. You could draw one a day and it’d be a constant challenge. And lots of fun! That would be interesting! Hm… I don’t know if I’d want to draw only birds for the rest of the year, but maybe for the rest of this month or for two weeks? I’m also totally up for the once-a-month thing. 8th of every month. I’m down with it! I’m throwing it out as a suggestion! Woot! Hooray! I’ll do it and suggest it on my blog too! Additionally, I’m going to go ahead and try doing a bird-focused creative exercise every day for the next seven days because I really liked the nothing-but-birds-for-a-while idea, and also because I missed Bird Day this month. Yay birds! Awesome!!! Woo, this is so exciting! I wish I had found you sooner. I would have tried! Your Bluebird is wonderful and inspiring. I will sort through my images of birds and try to draw one. If I am somewhat successful I’ll post it. I haven’t tried to draw anything in over 2 yrs. Hey, I just posted a new one proposing we do this on the eighth of every month! It’s starting to catch on. We’d love to have you join us! Your grandson too!! Your mother bluebirds looks wonderful, your mother will be so pleased! Thank you! I hope so. I promised her a larger painting, but that’ll have to wait til work lets up a bit. That is lovely 🙂 Great colours and textures. I’ll put that one in my 2015 calendar – it’s coming up so soon that I should be able to remember!!! It’ll be fun! I’m excited about it!